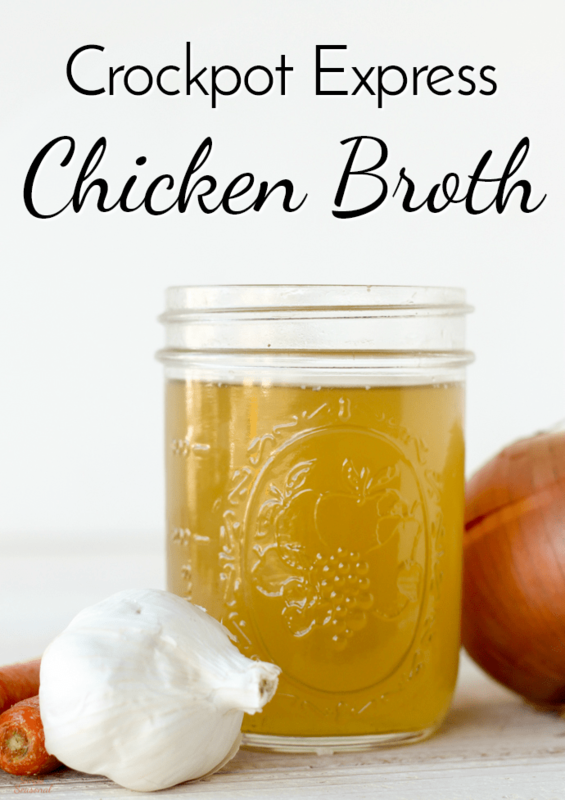 Enjoy the flavor and health benefits of broth in just a fraction of the time with this Crockpot Express Chicken Broth. It’s great for cooking and during cold and flu season it can help get you back on your feet more quickly! One of the things I was most excited about when I got my Crockpot Express was cooking chicken. We eat so much of it as a family because it’s easy to stretch and much cheaper than beef. Now that I can cook a whole chicken in less than an hour, I am buying more whole fryers and then making Crockpot Express Chicken Broth with the carcasses! Because a Crockpot Express (or any pressure cooker) needs at least 8 ounces of liquid to cook under pressure, I’ve been going through buckets of chicken broth! 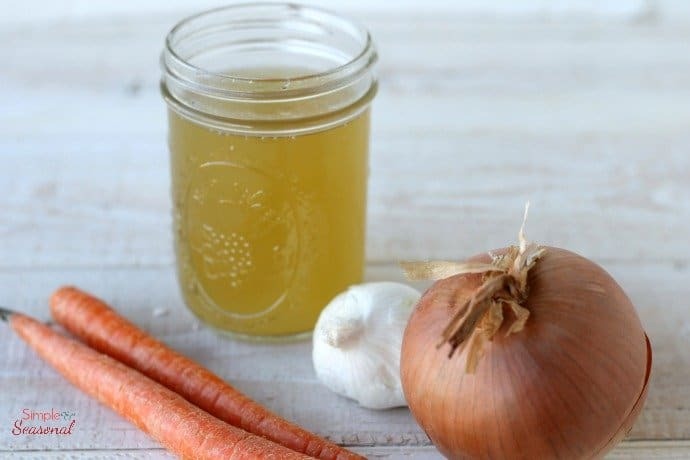 I could use water, but there are so many health benefits to homemade broth, and the flavor is just better. Broth, stock, and bone broth are all built on the same basic foundation: water, meat, or bones (or both), vegetables and seasonings, simmered and eventually strained to remove solids. You can read more about the benefits of bone broth and the science behind it here. Broth is made with the bones of a fresh whole chicken and simmered for 45 minutes to 2 hours. It is very light in flavor, thin in texture, and rich in protein. Stock is made with meat typical in a beef neckbone, which may be roasted before simmering to improve the flavor. Stock is simmered for 3 to 4 hours and is rich in minerals and gelatin. Bone broth is made with the bones that are typically roasted first to improve the flavor and then simmered for more than 24 hours to remove as many minerals and nutrients as possible. When finished, the bones should crumble when pressed lightly between your thumb and forefinger. This chicken broth could probably be considered bone broth, even though it only cooked for an hour. The bones were soft and crumbled in between my fingers when it was done and it was a nice rich color. Whatever you call it, Crockpot Express Chicken Broth is easy, quick and good for you! Place chicken carcass inside the cooking pot. Carefully pour water over the chicken until it's just covered up. My pot was full to the 2/3 line. Add vegetables and cider. Close the lid, set the steam release valve to closed and press the Meat button. Increase the time to 1 hour and press Start/Stop. When the cooking cycle is done, allow a full natural pressure release. Strain the liquid by pouring through cheesecloth or a small mesh strainer. Store in jars in the refrigerator for 2-3 days or freeze to use later. 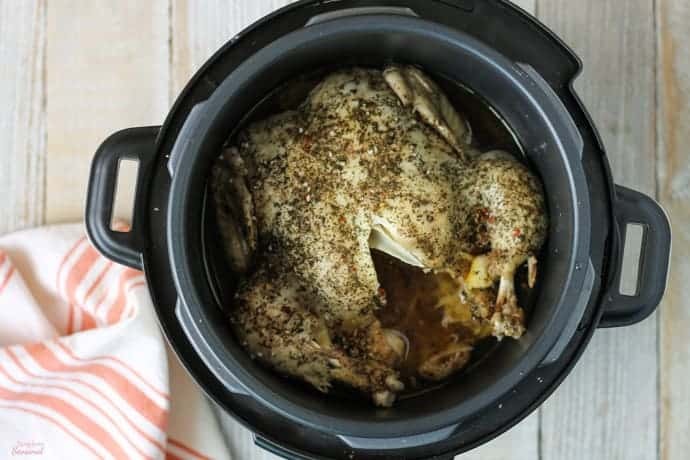 Be sure to check out Crockpot Express Recipes for all sorts of things to make in your Crockpot Express and tips on how to use it. You can also join our Facebook group, Crockpot Express Community here. 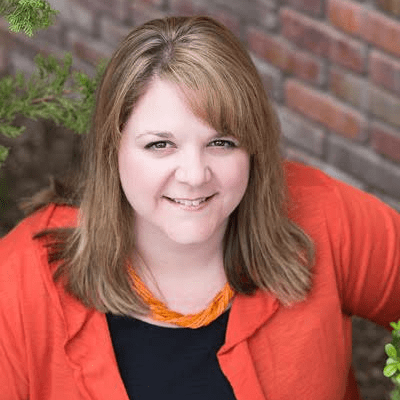 Thank you for sharing your recipes and knowledge! 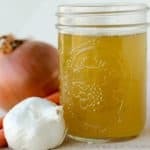 I’ve made this broth several times and love how easy it is!! I like how I can save money not having to buy broth!